American man living in UK to care for disabled British wife ordered to leave country. Make what you will of this one. Technically , said husband is in breach of UK Law but ..... ? Cases like this one open up a whole hornets' nest as to the Right of Residency witin the UK. .... and yet , we are actively encouraging foreign born people to work in the NHS and social care sector ? Difficult one under the present legislation. I will assume that our own supporting organisations will keep a low profile on this one ??? Even holding his coat whilst he fights his corner maybe a little too optimistic ? Disability Rights movement might just have something to say .... on behalf of the caree ? Perhaps our Government are missing a trick here ? Why not encourage UK disabled people to marry foreign based spouses , allow them UK residency , and " Pay " them as carers thus saving the taxpayers even more ??? Our Lord Kitch would be smiling .... more cannon fodder ! Last edited by Chris From The Gulag on Sat Oct 06, 2018 12:58 pm, edited 4 times in total. According to The Independent, Sandra was born in the UK and lived and worked in the country until 2002, when she traveled to the US and met Dale. The couple married several years later. She said that she feels as though the couple is being forced to divorce without their consent. "The prospect of him having to leave has made me really depressed," she said. "It feels like we're being divorced without our consent, like someone is unofficially divorcing us." Dale added that traveling back to the US would present a financial hardship as well. After airfare and rent back in the US, it would take up to a year before he could reapply for the visa. Despite arguments by their lawyer, a judge said there was "insufficient supporting evidence about how this would impact on his wife if they had to live apart". The judge then claimed the public interest in maintaining effective immigration control was "justified and was proportionate". The Home Office has declined to comment. This one will have no " Happy " or logical outcome ? Last edited by Chris From The Gulag on Tue Mar 26, 2019 8:08 am, edited 1 time in total. A victory for a carer ? The wife of a British stroke victim told by the Home Office that he must become the sole carer for their two young children has been told she will receive a right to remain visa after the Guardian highlighted their plight. The Home Office had previously insisted Leah Waterman had to return to the Philippines, leaving her husband, Simon – who uses a wheelchair, requires 24-hour supervision to keep him alive and cannot speak, write or reliably understand what is said to him – as the sole carer for their two young British children. Three days after the Guardian broke the story, Leah Waterman was told she would not have to return home to apply for a visa to care for her family in the UK. The Home Office’s U-turn comes after it previously insisted there were “no exceptional circumstances” preventing her following the conventional route of applying for her visa from outside the UK. Simon Waterman was living with his wife and their children, Kimi and Bryce, aged 10 and seven, in the Philippines when he had a severe stroke in September 2015. The family moved back to Abergavenny in south Wales in December so Simon could be near his family. However, they were refused a visa for Leah to remain in the country. The decision was made despite unequivocal evidence from multiple medical sources detailing the extent of Simon’s disabilities, his repeated life-threatening seizures – some lasting as long as seven hours – the risk of sudden death and the impossibility of him looking after himself, let alone his children. “I’m totally overwhelmed,” Leah Waterman said. “I can smile now and I think I will get my first good night’s sleep tonight for many months. I will tell my children when they get home tonight. They will be so happy. We have tried to hide this situation from them but they have guessed something is wrong and have been increasingly upset about it. Simon too can now concentrate on getting better instead of desperately worrying about me having to go back to the Philippines. Simon, a former soldier in the British army, requires 24-hour care from Leah and medical experts. His stroke caused major brain injury, resulting in paralysis on the right side of his body and significant weakness on the left. He struggles to walk outdoors, risks falling whenever he stands up and would be unable to get himself off the floor if he did fall. He cannot do even gentle exercise for more than three minutes without requiring a rest. Since his stroke, Simon has had regular post-stroke seizures, lasting between 30 minutes and seven hours. They can happen at any time and have led to him being admitted to hospital at least five times during the past 12 months. Despite extensive medical evidence submitted with her visa application, the Home Office rejected Leah Waterman’s application for leave to remain in the UK because she had entered on a visitor’s visa. It said it would not even consider her request for a change of immigration status, because she did not have the right clearance when she entered the country. Leah Waterman, however, explained in her application that the family had arranged her visitor’s visa before her husband’s stroke so they could visit his parents and sister for Christmas in 2015. She sought legal advice after Simon’s stroke and was told that she could not apply for a right to remain visa until her visitor’s visa expired in June 2016, by which time the family feared Simon might have died. Leah Waterman was told, however, that the change in her husband’s health would qualify her to claim exceptional circumstances and apply for the new visa from inside the UK, which she did in July 2016. In its refusal letter of August 2017, the Home Office dismissed that advice: “We have considered … whether there are exceptional circumstances in your case [for example, whether you returning home to reapply for your visa] would result in unjustifiably harsh conditions for you, your partner [or] a relevant child,” the letter stated. “In so doing, we have taken into account the best interests of any relevant child as a primary consideration. Based on the information you have provided, we have decided that there are no such exceptional circumstances in your case. More a victory for common sense ? Or , based on less cost to the taxpayer in the long run ? Nothing more on the fate of our carer in the first posting ... as I type. Last edited by Chris From The Gulag on Sun Jul 29, 2018 11:14 am, edited 1 time in total. Stop ‘inhumane’ deportation of husband who cares for disabled British wife, Home Office urged. More than 13,000 people back calls for Government to allow American national Dale McIntier, 62, to stay in UK with disabled wife Sandra. The Home Office has been urged not to deport an American man whose disabled British wife of seven years is reliant on him to provide her care. Dale McIntier, 62, came to the UK on a visitor’s visa with his wife Sandra in April 2015, and has been told he must return to the US in order to reapply for a spousal visa, or face deportation. If he goes back to the US, Ms McIntier would be left without a carer and having to rely on state support, which the couple and their supporters warn would have “devastating affects” on her. A petition created after The Independent reported on the case in August calls on the Home Office to stop the “inhumane” deportation of Mr McIntier. It has so far garnered more than 13,400 signatures. It states: “Sandra McIntier is severely disabled and requires round the clock physical and mental care. If her husband was deported it would have devastating affects on her. “Dale McIntier would suffer extreme mental health issues if he had to leave his wife without the love and stability that she needs. 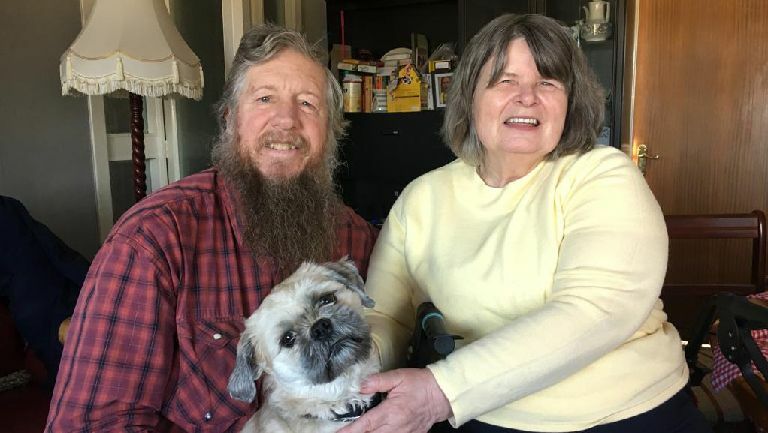 The couple initially came to the UK on a visitor’s visa to medical treatment, with a plan to stay for six months and then return to their home in Idaho. But this plan changed after five months when Ms McIntier, who already suffered from a genetic bone condition, was diagnosed with a fast-growing cancer which led to her requiring round-the-clock care. They decided that it would be best to stay in the UK for the foreseeable future to ensure her health needs could be met, so Mr McIntier applied for a spousal visa before his visitor status ran out in October. However, five months later he received a letter from the Home Office giving him five days to leave of the country. It stated that the couple had failed to provide relevant paperwork from a doctor stating Ms McIntier's inability to travel, a requirement they say they had not been aware of. After mounting an appeal against the decision, the couple were told by a court in a first-tier tribunal that Mr McIntier must return to the US in order to reapply for a spousal visa. The couple's solicitor, who did not want to be named while the appeal is still ongoing, told The Independent the judge had not applied the law in the right way. Under immigration law, spousal visa applications must be submitted from outside the UK. But the solicitor said the "compelling circumstances" of the case mean the Home Office should allow the appeal to take place outside such laws, allowing him to stay in the UK to care for his elderly wife. Speaking to The Independent, Mr McIntier said: “We just hope this petition will make a difference. We’re lucky to have so many people here who support us. "Since the weather’s turned colder Sandra has been in more pain. She really can’t travel much. We can hardly take a day out without it wiping her out for sometimes days afterwards. "She goes into depression really easily. She has no intention of going back to the States. Ever since we got married we’ve just needed each other. If I do have to leave, we’ll probably both be in depression. "It takes a certain amount to run a household. She would need someone to come in and take care of her. She needs me here pretty much 24 hours a day." Money ... always seems to be the number one consideration ... ? If so , what is cheaper for the taxpayer ... allowing a foreign born citizen to remain ... and to care under the terms and conditions most of us endour ... our Lord Kitch , take another bow ... OR ... allow the Authorities to care for the disabled wife ? As for the wife's preferences ??? Last edited by Chris From The Gulag on Sun Jul 29, 2018 11:14 am, edited 2 times in total. Posting on another thread triggered my recall for this one ... and a result !!! Visa row man allowed to stay in Scotland to care for wife. American Dale McIntier faced deportation after his wife was diagnosed with cancer. An American man who faced deportation despite being a full-time carer to his cancer-stricken wife has been allowed to remain in the UK. Dale and Sandra McIntier came to stay in Scotland for six months during 2015 while they visited family and Sandra received medical treatment for a bone condition. But while staying in Largs, Mrs McIntier, who was born in England but lives in the US, was diagnosed with an aggressive form of cancer. Mr McIntier applied for a spousal visa before his visitor status ran out but was told he would have to return to the US. However, he has now been told he will be allowed to remain in Scotland to look after his wife. Mr McIntier said: "It's like a 100lbs weight taken off my back. I'm just totally ecstatic." His wife added: "I couldn't believe it, I immediately went on Facebook and thanked all my friends and the people in Largs for supporting us because the people here have made a big difference. A victory for ... common sense ? This is awful! I am in an opposite situation, where I am a U.K. Citizen who went to live in America. I have recently returned to care for my Elderly parents and I am having a terrible time getting anything. I can’t get Carers Allowance because I have not lived in the U.K. for the last 2 out of 3 years. That in itself is disgraceful. Then I’m struggling to sort out Incime Support. I have a small job, so I don’t currently need income support, but there was a 2 month period where I should be eligible. However, after nearly 3 months since I took a Habitual Residency Test, I don’t know if the DWP determine that I am resident in my own country. Then they tell you lies that if you’re not getting Carers Allowance, then you can’t get income support, which is wrong. I digress though, what I’m saying is that the DWP don’t even want to look after U.K. Citizens, let alone anyone else. If they are Married then this shouldn’t even be an issue. How can they separate a Married Couple? My earlier comment on the " Win / Win " situation would also apply to those carers returning with their caree to the UK. Trouble is two agencies are involved ... as mentioned in another recent thread ... DWP and Home Office ... neither are covering themselves in glory. No information out there on the numbers of UK carer / carees living abroad. ... or on how they are been financed if UK benefits are not being paid. Brexit / Euro Zone splitting up ... things could get rather " Interesting " if the cards dealt are merely a ten high ? Gwendolyn Banks, 62, was born in US but moved to Aston, Birmingham, aged 5. Became legal guardian to Sienna, 4, after her daughter Sinead died at age of 24. Applied for more benefits as she cares for her ill ex-husband and granddaughter but was told she 'failed the Habitual Residency Test' and now could be homeless. A grandmother who has lived in the UK since since she was five is on the verge of becoming homeless with her granddaughter after authorities told her she's not a UK citizen. Gwendolyn Banks, 62, was born in America but moved to Aston, Birmingham, when she was a little girl before working in the city most of her life. After her daughter Sinead, 24, died suddenly at the beginning of this year, Mrs Banks became a full time carer for her four-year-old granddaughter Sienna. The grandmother now faces losing the home she's lived in since the age of 21 because she is not being classed as a UK citizen. Mrs Banks, who cannot work due to ill health and is a full time carer for her ex husband, was told she needed to claim for Universal Credit for her benefits to continue. 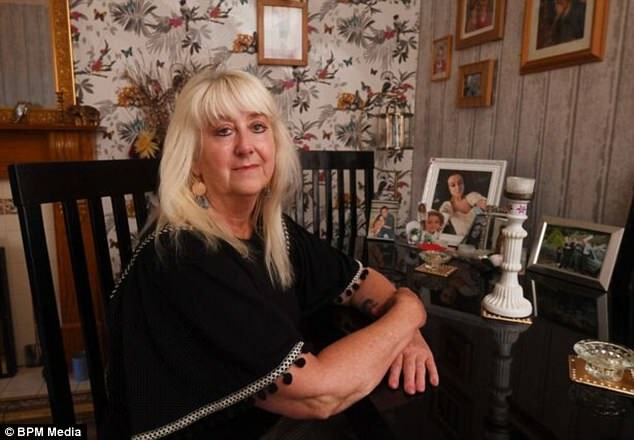 She was previously receiving Employment Support Allowance (ESA) but contacted the Department for Work and Pensions (DWP) because she required more financial help to support her four-year-old granddaughter, Sienna. But the DWP closed Mrs Banks' claim because she had failed the Habitual Residency Test. She is now going through the appeal process. Mrs Banks in now struggling to survive on just £80 per week, compared to the £200 per week she was previously getting. She is also no longer receiving Housing Benefit (around £80 per week towards her £90 rent bill) or help towards her council tax and still has to pay £13 Bedroom Tax. Mrs Banks said: 'I could not believe what they were telling me. 'I was told I needed to change from ESA to Universal Credit and then they close my claim because they cannot class me as a British Citizen. 'While I appeal this, I have limited money coming in and I can't afford to live. I was born in America but England is my home. Mrs Banks' 24-year-old daughter, Sinead, died suddenly in January this year after suffering a cardiac arrest. 'I am still trying to come to terms with the sudden loss of my daughter. 'And when I enquire for extra financial help to look after my granddaughter, they drop this bombshell on me. Mrs Banks has not received her full benefits entitlement since the beginning of this month and is now in rent arrears, as a result. She has been summoned to court and told she is at risk of losing her home. 'As soon as my claim was closed, my benefits stopped,' she added. 'So my arrears have built up and gone over the £1,000 limit, which means I could lose my home in a matter of weeks. 'I have lived here most of my life and I do not want to give up my home. Mrs Banks' parents met in Ireland and moved to America for a brief period before bringing their young family to England. The 62-year-old has an American passport. A recent letter from the DWP to Mrs Banks stated: 'We have closed your Universal Credit claim from 19 March 2018. 'This is because you have not passed your Habitual Residency Test. 'This means that you won't receive any further payments of Universal Credit. A DWP spokesperson said: 'Ms Banks' case is currently being reviewed by a specialist decision maker. Phew .... a full house in this case ?
" How many ? I'll stick with these. " ... smiles / frowns around the table ... a bluff , or genuine ? As all our supporting organisations tend to live in their own little worlds , how MANY would need to be involved in this case ??? Another one to keep an eye on ... how many more out there ? Perhaps the carer army would agree to knock a few £ 's off our credit balance to assist our comrade ? After all , it stands at a minimum of £ 132 BILLION !!! Even at 0.1% interest , that's £ 36,164.38 per day ! I am reading this with jaw dropping incredulity ! Totally insane, it really is another one of those "The computer says no!" Is it just a matter of box ticking and if there isn't a relevant box to tick the case gets thrown out? What this poor woman has gone through and is going through beggars belief. So she is sent back to the US, her grand daughter is taken into care and her ex has to rely on social services ! Well of course that makes total sense doesnt it? !